When it comes to TV there’s nothing more Pop than Glee! And at SCP office its spoken about and re-enacted every week! We kid you not! Sorry we digress... Appearing in the second season of the smash hit series, super hunky Darren Criss first stole our hearts as Warbler Blaine with his incredible vocals, broodingly handsome looks and funky dance moves. His renditions of Train’s Hey Soul Sister, Maroon 5’s Misery & Pink’s Raise Your Glass cemented him as a Glee favourite and brought him international recognition for his amazing talents. Now a full cast member of Glee, and on-screen boyfriend of the fabulous Kurt Hummell, he’s been nominated as Sexiest Man Alive and has had some super hot pics taken of him, all buff, on Malibu beach! 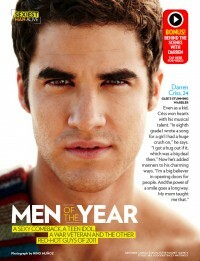 Check out the video with the shirtless Blaine.. we mean Darren below!